Demand to study Economics when it’s supplied in Barbados! Would you like to travel for two weeks to the white-sanded paradise, eastern Caribbean island and independent British Commonwealth nation of Barbados? The city of Bridgetown alone is an UNESCO World Heritage Site filled with fascinating historic sites to explore. While enjoying the sunsets and colonial history, you can be studying Economics with your toes in the super soft sand; at the same time, you can earn 3 credits for ECON 100 at Coquitlam College, a credit which can be applied to your Associate of Arts Degree or another Certificate or Diploma at Coquitlam College, or can even be transferred to McGill or UBC for equivalent credit! 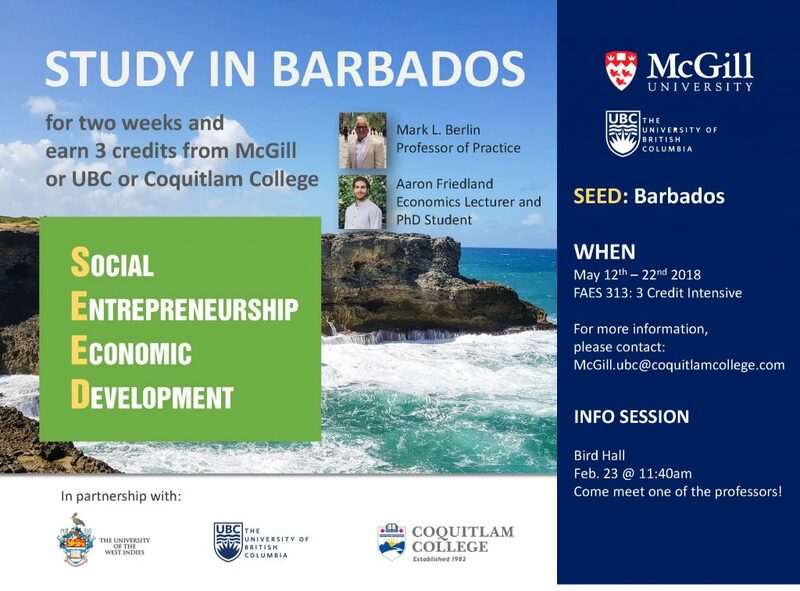 Classes take place May 12-22, 2018 in Barbados in partnership with Coquitlam College, the University of The West Indies, the University of British Columbia, and McGill University. Remember, ECON students: the supply relationship is a factor of time. There’s still enough time to register and apply for your Student Visa if you hurry! Please come to Student Services as soon as possible if you’re interested.